With the passage of the Women, Peace, and Security Act of 2017, the United States is now required by law to improve women's participation in peace and security processes, including in efforts to reduce radicalization and violent extremism. Senator Shaheen, a lead sponsor of the law, discusses the implementation of this law and how women's contributions can improve the effectiveness of U.S. security operations around the world. For further reading, please see the CFR blog Women Around the World, CFR’s Women and Foreign Policy Program homepage, and CFR’s interactive report Women’s Participation in Peace Processes. BRENNAN: Good morning. Good morning to everyone. Thank you very much for starting off your day with us here at the Council on Foreign Relations. This is, of course, as you know, Senator Jeanne Shaheen. BRENNAN: (Laughs.) Thank you. Thank you very much. Thank you very much. I’m very excited about it too, to be very honest with you. (Laughter.) And I’m still also the senior foreign affairs correspondent at CBS News, so I’m particularly interested in this topic for our conversation today. I will be presiding. And I just wanted to quickly thank the Compton Foundation for generously cosponsoring this program. And for all of you in the audience, as you know, as per usual, I’ll come to you for some questions about 30 minutes into our conversation. And it’s on the record, so journalists in the room can benefit from that. So we thank the senator for coming and joining us today to talk about the Women, Peace, and Security Act. So let’s dig right into the topic. Senator, I was looking at this now law that you sponsored here, and the language in it right at the opening says the U.S. should be a global leader in promoting the participation of women in conflict prevention, management, resolution, post-conflict relief, and recovery. Can you tell us exactly what you had in mind when you—(laughter)—when you sponsored this? SHAHEEN: Well, first of all, I think it’s important to point out that the United States is the first country in the world that has actually codified this Women, Peace, and Security Act. So there are a number of other countries that have plans in place, but we’re the first country to actually have passed it through legislation. And I want to give credit to lots of people who have worked on this for past Congresses because there have been a lot of people who have worked on it for a very long time: the previous administration; my colleague Barbara Boxer, who served on the Foreign Relations Committee. So it’s been the result of a lot of effort for a long time, and it’s really exciting to see it pass. Now, why is it important? Because what we know—and I think one of the best ways to remind people about why this is so important is to look at the data. So, for all of the groups that have been working on data about what a difference it makes, it’s really important to point that out, because we know when women are at the table that negotiations are 64 percent less likely to fail, so that’s a huge number; that agreements are 35 percent more likely to last for 15 years or more. So there is good data to show that having women at the table, which most of the women here would agree to, really makes a difference in terms of how peace is negotiated, conflict is negotiated, and then how lasting it is. BRENNAN: Were there specific examples you had in mind? When you say 64 percent, I mean, where in conflict zones have you seen this as sort of the model you want to replicate? SHAHEEN: Well, I think we’ve seen it in a number of places, almost anywhere where there’s been conflict and women have been part of it, whether it’s in Northern Ireland, where women were at the table—I remember visiting, when I was governor, going to Northern Ireland on a trade mission, and meeting with a number of politicians on both sides, and having the women talk to me about what they were doing to try and resolve the conflict issues there. I had the opportunity to meet with a woman from Yemen last fall at the Halifax Security Forum who talked about and who was very instrumental in some of the—when the Yemeni conflict was just beginning in how she and other women were very involved in trying to resolve that issue. Sadly, it’s deteriorated dramatically since then. But we have lots of examples. What we don’t have as many examples of is women in high-profile positions who have actually been leading negotiations. Unfortunately, we really only have one example of a woman who led negotiations and then actually signed the peace agreement, and that was in the Philippines with Ms. Ferrer. So we need—we know that women make a difference, we know it matters, and we need to make sure they’re empowered to have—to be at the table and to have positions as part of negotiations. And that’s part of what this legislation is designed to do. BRENNAN: Now, as part of this law, it compels the people implementing our foreign policy to take this into consideration when they’re thinking about planning. I mean, what have you seen from President Trump’s State Department, as led by Secretary Tillerson? Is he personally engaged on this issue? SHAHEEN: I have not had a conversation with him about it. I have had more conversations, actually, with the folks at the Department of Defense, and I understand we have a number of those people here this morning. So thank you all very much for your engagement and your willingness to try and make sure this gets implemented. So I do have a commitment there. I think one of the challenges in the State Department right now is that while we are going to continue the Office of Global Women’s Issues, we don’t yet have an ambassador or a person appointed to head that office. And that is challenging. BRENNAN: There are a lot of ambassador positions that are still open. BRENNAN: Forty-one embassies, I believe, still. SHAHEEN: Yes, in some very important places like South Korea. And Germany, while someone has been nominated, we don’t have anyone yet in that position. BRENNAN: So where does this ambassadorship rank? I mean, do you have any sense of if the State Department’s working on this, if the White House has names? SHAHEEN: I don’t. There have been some names floated. Most of those names are not people who I think would be the right person for that position, so I’m glad that they’ve gone back to the table and that they’re still looking. So I think if there are thoughts about who that person should be in this room, I hope you will bring them forward so that they can be considered. BRENNAN: And you were actually talking about trying to compel a decision by actually forcing a law or some kind of deadline here. Do you think you have to go to that level in order to get an appointment? BRENNAN: And you don’t have that from current leadership on the committee? BRENNAN: That was a very diplomatic way to say that. (Laughs.) But Senator Corker has not put his shoulder behind this? SHAHEEN: I don’t think it’s been his top priority. So, again, for all of you in the room—(laughter)—contact the Foreign Relations Committee, the leadership and the staff, and let them know how important it is to fill this position. SHAHEEN: And he’s been very good on that issue. He’s made that a priority, and it’s really made a difference. BRENNAN: Is the president’s daughter, Ivanka Trump, in any way someone you would think of in this position? BRENNAN: Because of her interest, at least, in these issues? SHAHEEN: I certainly think getting her engaged on this issue would be very helpful in terms of getting somebody in that position. I don’t know—you know, I haven’t had any conversations with her, so I don’t know if she would be interested or, given the other challenges at the White House, whether that makes the most sense. You’re the only woman on the Senate Foreign Relations Committee, and I point that out because you’re saying it is not necessarily seen as the same priority you think should be put on this issue. Do you think, in terms of managing conflict and managing issues, that there’s something that you inherently bring to this job that others don’t? I mean, do you sort of see yourself, when you’re imagining these women you’re writing this law about, as filling that same role? SHAHEEN: Well, you know, my standard response on that—and I think it’s true—is that as women, we have different life experiences. You know, they’re not any better or worse than men’s, but they’re different. And when we’re at the table, we bring that perspective. And it’s really important to have that perspective at the table. And I think, you know, that’s true whether it’s the Foreign Relations Committee, whether it’s negotiating a peace agreement, whether, you know, it’s at a—in a boardroom. If we don’t have that perspective, then we’re missing half of the population in the world. So it’s really important to make sure that women are represented. And we also know, as I said—because the data tells us—that in conflict, women are often just better at peace because we are more likely to be interested—more interested in peace than we are in conflict. BRENNAN: For you, when you look at the current administration, do you see any natural allies on this? The ambassador at the United Nations, Nikki Haley, has she expressed interest in supporting—implementing some of what you’re talking about on that level? SHAHEEN: She has been—she has been supportive. Her verbal remarks have been supportive. She’s obviously been engaged in other areas, so we haven’t seen action follow those remarks yet. But I’m hopeful that as somebody who understands this issue, that she should be an ally. BRENNAN: The Human Rights Foundation had issued a statement pointing to major gaps in the implementation of this kind of agenda: a lack of accountability at the United Nations, poor monitoring of these standards. You’re concerned about implementation of this U.S. law, but on an international level how do you follow through on what are for many people very high-minded principles? SHAHEEN: Well, again, we need people who are committed and who will make implementation a priority. One of the things—I had the opportunity to meet with the U.N. women’s ambassador—the ambassador for women’s issues at the U.N. not too long ago, and we were talking about the passage of the law. And she was talking about her experience with the Colombian agreement with FARC, and she relayed to me a story. She said, you know, one of the things that the women who were involved in that told me is that there were women on both sides of those negotiations, and that when they would hit an impasse they would signal to each other, and they would go in the ladies’ room—(laughter)—and try and figure out ways around so that they could keep the conversation moving. And that’s a great example of how women have made a difference in getting to an agreement. Now, we have to see how that plays out long term, but I do think that there are people at the U.N. who are committed to this who want to see it be a priority. The other thing that’s important to point out about the U.N. and about the importance of women is that one of the challenges, we know, at the U.N. has been around peacekeeping. And we know that when women are engaged in peacekeeping, we’re much less likely to see incidents of sexual violence, of some of the other challenges that peacekeepers have had in places around the world. And so the more we can make sure that women are part of those peacekeeping missions, the better. We have—now for the first time finally have a woman who has led one of those peacekeeping operations, a general from Norway. So the more we can engage women there, the better. BRENNAN: Given the Trump administration’s at least stated intent to pull back on some of its funding to various United Nations programs and some foreign aid, how do you actually—you know, the financial incentive is often there to implement some of these American values that we have attempted to export. How do you actually get anyone to follow through with what you’re laying out here as such a foundation for any kind of future negotiation? SHAHEEN: Well, that’s a challenge, and it’s a challenge we have to keep at. You know, we can’t assume that because we’ve passed this law that it’s done and we don’t have any more work to do. And it’s a challenge that we not just need to hold our lawmakers’ feet to the fire in terms of implementing, but we need to make sure that the public—that all of you who are engaged on this issue, who care about it—continue to agitate, to stay engaged, to make sure that you’re talking to your legislators, that you’re talking to the people you know in the State Department and the Department of Defense to make sure that implementation continues. And we need to—we need to get regular reporting. We need to make sure that people follow through on the commitments that they’ve made. So that’s one of the challenges that I am going to have. I’ve had the opportunity to get a commitment from individuals who have said they will follow through and make sure the law gets implemented. But now we’ve got to hold them to it. BRENNAN: In the—there are no, that I can point out to you, imminent negotiations. Certainly, that’s the stated goal with the Syria policy going towards Geneva. BRENNAN: There’s the stated goal of eventually getting to a negotiating table in Afghanistan as well. But you hear from the Trump administration that anything, particularly in the case of Afghanistan, has to be realistic, that it can’t be about, you know, export of values in a way that implements an American vision of how things should be on cultural traditions that fly in the face of that. BRENNAN: Is that a way, in your view, of saying we’re going to drop the demand for honoring the constitution there as it exists, including recognition of the rights of women? Is that something that concerns you in that particular case? Or do you see what the Trump administration has described as their approach to human rights—that they’re best handled in private, not publicly—something that you can work with? I mean, what is your understanding of how—I know you said you haven’t been able to talk to Secretary Tillerson about this—but for those who do work with him, how they actually see applying this to the most immediate models? SHAHEEN: You know, in Afghanistan I’m actually very optimistic about the potential to keep women engaged there. For one thing, again, that’s a place where I’ve had—I sit on both the Armed Services Committee and the Foreign Relations Committee. So I’ve had a chance to quiz our military leadership there about this. And every time I’ve had a chance to do that, they have reaffirmed the commitment to Afghan women and girls. As I talk to people in my state of New Hampshire, where the war in Afghanistan is not uppermost in people’s minds, whenever you talk about Afghanistan the first thing people talk about is are we going to keep our commitment to the women and the girls in Afghanistan. The public cares about this issue. And so I don’t think we’re going to walk away. And we’ve also empowered—the women in Afghanistan have been empowered. All you have to do is talk to the women leaders there to know that they’re really out there trying to make a difference on issues to make sure that girls can get an education, to make sure that human rights issues are being addressed, to look at representation in parliament there. So I think in Afghanistan we have a real opportunity. And if in fact President Ghani is going to be successful in reaching out to the Taliban and other groups there and trying to start negotiations, pushing to make sure that women are part of those negotiations will be very important. BRENNAN: The Obama administration always included that in at least their stated precondition for any kind of negotiations with the Taliban—ones that never materialized, of course. But they said, recognizing the constitution and its rights for women that are guaranteed. Does that maintain—is that being maintained by the Trump administration? SHAHEEN: I think it’s being maintained as a part of American policy. BRENNAN: So, for you, what does that mean? That means as a lawmaker you will continue to say this needs to be part of any future talks? BRENNAN: But you don’t have a pledge from the administration that that is policy. SHAHEEN: I don’t. But I think we have a pledge from our people on the ground in Afghanistan that this is a commitment that they have. And, you know, let’s be honest, we have a different message coming out of the president than we have coming out from some of the other parts of the administration. We’re hearing something different on some of these issues from States and Defense than we are from the president and the White House. So I think, again, one of the things that we have to do is to make sure that we hold people’s feet to the fire on what is U.S. policy. BRENNAN: So can you explain a little bit about that there, because Secretary Tillerson says that he and Secretary Mattis walk into every NSC meeting having already discussed the issues and saying, you know, essentially, they’re going to be each other’s wingman. When you’re saying you’re hearing more from the Pentagon than the State Department, to you that doesn’t necessarily mean you have the support of both of those Cabinet members in implementing this? SHAHEEN: Well, I don’t know without having talked directly, so. BRENNAN: Why don’t you think he’s spoken to you directly on—have you asked for a meeting with Secretary Tillerson on this? SHAHEEN: I have not, on this. BRENNAN: Is there a point person for you at the State Department on these issues? SHAHEEN: There’s not somebody that I have dealt directly with on these issues. BRENNAN: And is that—do you think that’s just because there are so many vacancies, or do you read that as a symbol of something else? SHAHEEN: So I mean, I think you’ve got a lot of opening at the State Department. You’ve got a changeover. I think it’s unfortunate what’s happened at the State Department. And I have been a critic of what’s happened there. But I don’t necessarily attribute a lack of commitment on the issues around women, peace, and security to malice. I think it’s more a result of people not being in positions and having a lot of priorities. And this one is not on that agenda right now. BRENNAN: You said the Pentagon has been more engaged with you on this. What do you attribute that to? SHAHEEN: The ability to have those folks in front of me so I can ask questions. BRENNAN: (Laughs.) You mean in terms of holding hearings, or what do you mean have those people in front of you? SHAHEEN: Yes. Of having people at hearings, of having people be nominated for those positions, and having a chance to get commitments before I agree to vote for them. BRENNAN: So the machinery is running a bit more smoothly, you would say, there than what you’re experiencing at the State Department, it sounds like. BRENNAN: And then, at the United Nations, I know you said Ambassador Haley herself hasn’t necessarily taken this on. But are there people within that arm of the foreign policy establishment who are carrying through what you were specifically calling for here, which is American leadership on this international issue? SHAHEEN: Not that I’ve been involved with. BRENNAN: And what do you attribute that to? SHAHEEN: Well, again, I think while the legislation passed last fall, we are in the stage where now we’ve got to get things up and running and call people’s attention to it and getting commitments. And so we’re still in that stage. So I’m not a believer that that means that people are not going to be committed and work on it. I think my goal is to make sure people are committed and working on it. And we have to take that approach. BRENNAN: Internationally, have you found partnerships that could be helpful on this? I mean, in Canada, at least their prime minister has publicly said that he really wants to make some of this a priority. SHAHEEN: Yes. I think Canada. I think the EU there are—they have appreciated the importance of making sure that women are at the table. I think there are other examples in Africa where there’s a recognition that this is important. BRENNAN: I want to ask you a little bit about our own national security establishment. Months ago, in the midst of this #MeToo movement, there was a letter issued by around 200-or-so national security professionals who decided that it was time to go public, and basically said the American government’s not helping to protect their first line of defense here. And they pointed to what they said was an inability or a lack of interest at the State Department to follow through on claims of harassment, on investigations, or not being elevated for positions. Have you take on that issue, given your role on Senate Foreign Relations, because you have oversight? I mean, how much concern do you have about these issues that were raised? SHAHEEN: I’m very concerned about it. And this is an issue that has had attention from the Foreign Relations Committee. We did a letter led by Senator Cardin when he was ranking member there to raise these concerns. We haven’t gotten an adequate response at this point. BRENNAN: Secretary Tillerson has been speaking publicly, or at least to the foreign service officers, about his interest in looking into some of these backlog complaints. What do people need to know? I mean, how much concern should there be about protecting these people who are working in national security? SHAHEEN: Well, a great deal of concern. And it’s not just about women and being subjected to sexual harassment. It’s also what’s happened to the ranks of our foreign service officers at the State Department and the number of experienced ambassadors who have left, and a whole range of challenges there. And I and others have brought those to the attention of Secretary Tillerson on multiple occasions. And they now seem to be responding in a more positive way. But there’s a lot of work that needs to be done there. SHAHEEN: Yes, it’s a huge issue. BRENNAN: What is—what does that come from? Is that simply the bureaucracy? Is it this failure to follow through on harassment claims? I mean, what have you seen in terms of some credible allegations that makes you decide: This needs to be raised at the highest levels? SHAHEEN: It is an issue at the State Department. It’s an issue throughout our federal government, in most agencies. I mean, sadly. And when you’re dealing with a bureaucracy that we have in the State Department, where there are long-established requirements for how people rise through the ranks, it’s harder to make those changes than in some other places. And so it’s one of those things that we have to continue to look at and continue to see how we can make changes that are going to be positive. And in this current environment, it’s even more difficult because, as I said, we’re dealing with a State Department where we’ve lost a lot of expertise, where we have openings, where we’ve had a reluctance to—despite what’s being called the reorganization effort, there’s been a reluctance to look at some of these issues. So I think it’s going to be an ongoing challenge and one we’ve got to continue to monitor and try to address. But it’s true throughout so much of the federal government, as we all know. It’s true—you know, one of the things that has been interesting to me as we look at women in elective office, for example. One of the things that has had an impact on women in elective office in terms of increasing numbers has been term limits. It takes women longer to get in positions, so when we’re wiped out by term limits it takes us longer to get back into those positions. Well, the same is true in the State Department, where we’ve got this hierarchy. It takes women longer to get through the ranks, so it’s going to take longer. When we’ve—when we’ve wiped out a number of our experienced ambassadors, it’s going to take longer to get women back to those positions. Q: Thank you. Elizabeth Cafferty U.N. Women. Senator Shaheen, so nice to see you. And thank you for repeating the story from our executive director, which I think is a great one, on Colombia. I wanted to touch a little bit on women’s groups, because we see that as one of the sort of missing pieces, or a piece that is not strengthened enough in this agenda. So as you intimated, even in the toughest places—Afghanistan, Yemen, Syria—there are women’s groups who are actually active, knowledgeable, and organized on the ground. What could the U.S. do, in partnership with the U.N., on its own, to further empower women’s groups, give them a space, and sort of leverage the incredible work that they do for such a small amount of money? Thank you. SHAHEEN: Yeah. Well, certainly supporting civil society groups and including women’s groups is part of that, is very important. Making sure that the funding continues to be there to support some of these initiatives. And that’s a place where there has been an interruption in the funding. And we need to make sure that as we look at this new budget agreement that we have, we need to make sure that those groups continue to be funded. I saw, and some of you may have seen this article about the importance of engaging Syrian women in trying to address the conflict there. But one of my favorite parts of the article was a story about how when Assad troops when into one of the villages, that all of the men stayed inside because they were worried about getting shot. And the women all came out and actually ran the invaders out of town. They sort of encircled them and got rid of them. So I think it speaks to the power that women have when they’re organized. And that’s why the women’s groups are so important, because they provide that kind of support that sometimes women need in order to understand that they can make a difference and that they have support to do that. So we need to make sure those efforts are funded. SHAHEEN: Good. Tell us what you’re doing. Q: I will. (Laughter.) And I will be brief. But, Senator, it was my boss, Assistant Secretary Owen West, who was one of those individuals who had the opportunity to go before your committee, to go before you and all the committees for, you know, nomination in his appointment. And the first day after he was sworn in, the first thing he said to me was: Mark, we have to go up to the Hill. We have to talk to Senator Shaheen and her staff about women, peace, and security. And he is committed to that. I will tell you that he is not here today because he is at U.S. Special Ops Command down in Tampa today. But he sends his regards. And he sends his commitment to continuing the good work of women, peace, and security. I am not a political appointee. I was part of—I’m a civil servant, part of the last administration. You know, worked for the last administration. And that work, I can say, continues. And the Women, Peace, and Security Act has helped that and this administration, Department of Defense, is working with the National Security Council and State and AID in developing what’s that strategy for women, peace, and security. So we’re an active member of that. We also have a monthly sync group. And our DOD team over here in Colonel Joe Holland and Commander Mainer (sp), and Lieutenant Colonel Fulton (sp), and Beth (sp), and Stephanie Hammond from my team. And I say that because we have a committed team who work with all the COCOMs every month to talk about—that’s the combatant commands—about women, peace, and security, to synchronize our activities and our operations so that it continues. For DOD, what we need to do next is, with the strategy, we need to come up with a DOD instruction. In that instruction, we will outline exactly what we need as far as the—do we need gender advisors at all the combatant commands? Right now PACOM and Africa Command have gender advisors, but that’s taken out of hide. We don’t have a specific funding in the department for women, peace, and security. It would be nice to have that. If we had that, we could—we could fund gender advisors, we could provide the training that’s needed. But without that, that doesn’t mean we need to stop. We need to continue doing what we’re doing. So we will continue working on all of the training and trying to provide efforts, put women, peace, and security modules in our professional military engagement, the opportunities—professional military education, I’m sorry. That’s through the war colleges. That’s the senior enlisted academies. Those are the kinds of things that cost money, but if we put a module in we don’t need money. But if we had money, then we could put more robust training into what we are doing. Q: Yes, ma’am. Thank you. So we need to do more homework, what do we need for DOD. And then we will go back. And then the theater campaign plans, I’m happy to say that all the COCOMs, the regionals—AFRICOM, EUCOM, PACOM, and CENTCOM—all have women, peace, and security into their theater campaign plans. I tell you that because it takes, like, two years, because those theater campaign plans start, you do a year ahead, it’s in all of those campaign plans. So we’re proud of that effort. We will continue to push it into all of the ROE and all of our instructions because what we need from women, peace, and security is we don’t need a specific program that’s special that people attend an event, do it, and then forget about it. We need to thread and weave this through the fabric of everything we do within the department, because the Department of Defense is more effective in all of our activities and operations when we include 50 percent of the population. I can give you examples about that, of how we have done that. But two weeks ago I was in Raqqa because I work on stabilization, and I can tell you that the Raqqa civil council, Tabqa Civil Council, these are the Syrians on the ground. And there are women in the room leading these efforts. And our military and our State Department, we have State and AID people working with DOD on the ground in northeast Syria. And they are working with women to try to get a better effect. BRENNAN: Actually, Mark, I have a question for you if I can. (Laughter.) How many people are actually working with you on this at DOD? And do you have State Department counterparts? I’m not talking about the nine to 12 people working in Syria right now on that entire issue, but specifically on this one. Q: Right. Well, specifically, like, on women, peace, and security, I have a team that’s on my team, and the people that are sitting around the table work from the Joint Staff. So there’s people in the Joint Staff, in OSD policy that work on that. And then we have our counterparts at State, at USAID, at the National Security Council. So we are all working. We have interagency meetings to talk about specifically the Women, Peace, and Security Act. So that is a team of a number of people. On the Department of Defense side, we have a whole host of members of the team when every month Stephanie—I thought Stephanie was back there, but Stephanie is right here—who on my team, she and Suzanne (sp) co-chair a sync meeting. And in that, you have every COCOM. What we’re trying to do is we started with the regional, now we’re going to add the functional COCOMs—TRANSCOM, STRATCOM—because they have a value—they won’t meet with a lot of foreign counterparts, but there are things that we need to enhance, because they certainly relate and work around the world. So on DOD, each combatant command has a gender advisor. Even if it’s not a full-time job, it’s a part-time job. What we’d like to have is a full-time job. So there are people who are taking this as a collateral duty. So I don’t have exact number, but it’s a host of people. BRENNAN: But you have someone you can call at the State Department? BRENNAN: Can we go to our next question, thank you, on this side of the room. Here. Hi, I see you. Hi. I think that’s Anne, right? Yeah, OK.
Q: Hi. Anne Richard from Georgetown University. And I’m sitting here in a corner of former State Department women, including high-ranking ambassadors who have left. (Laughter.) So you might anticipate that we’re not thrilled about what’s going on right now. And I think that it’s not just an issue of vacuum at the State Department, which would be bad enough. But it’s actually that bad policies are being implemented without then your ability to have oversight, because there’s no one to bring up to talk to about them. And so there is no assistant secretary for democracy, human rights, and labor. There’s no one in my old job, population, refugees and migration. And meanwhile, all the funding for the U.N. Population Fund, which was doing so much good work on reproductive health in Syria and around Syria, is gone. Half the money for Palestinian refugees, gone. A candidate for the International Organization for Migration who’s unelectable. And no involvement in the global migration compact that is so important to lots of countries around the world. So when you add all these things together, this is a real erosion of support for vulnerable women and children around the world. How can we help you to have more oversight of these policy decisions that are being made without policymakers there? Somehow magically they’re just emanating from the White House. Thank you. BRENNAN: What do you mean by that? The secretary of the president? SHAHEEN: Well, I’m focused on 2018, so I want to flip the Senate, myself. SHAHEEN: (Laughs.) But I think the other way is—two ways are through data. So information and stories. What has been the impact of what’s going on right now? Because that’s the great way to persuade people about what’s happening. So the more we know, the better. So the more you can share with us so we can try and raise these issues when we have the opportunity, the more helpful it is. So thank you. And I know most of you know Noz (ph), who was also at the State Department, who works with me. Noz (ph), where are you? Back there. So if you—if you have a question about who should you talk to, Noz (ph) is the person who can also get information. BRENNAN: Here in the center of the room. Q: Good morning. I’m Lyric Thompson with the International Center for Research on Women. Thank you, Senator, for your leadership on all of our issues, especially this one. You’ve just take the appropriations question off the docket. So thank you for that. Next question I think would be, since we’re fortunate that this is a bipartisan issue, and this is something—I was just in Canada for the first Sherpa meeting for the G-7. Our U.S. Sherpa was, like, proudly touting the Women, Peace, and Security Act as a win. I think we have opportunities here. What are the touchpoints between now and October that you’re thinking about with your colleagues across the aisle to help continue to inform and shape the strategy that will come out of this? Is there an opportunity to address the issue of violence against women in our own forces, which was a blind spot in the last act? And then finally, could you do something about the human rights reports and the stripping of women’s rights language from that please? Thank you. SHAHEEN: You know, the thing that I’m most focused on at this point is trying to get somebody into the position of global women’s issues at the State Department. I think that's our next point where if we could get somebody in that role who could help make a difference, who has an understanding of the challenges that we face, that would be the most positive thing that we could do in the immediate term to make a difference. I would love to do something about the language. I don’t—again, we’ve got to engage, as you point out, people on both sides of the aisle at understanding why these issues are so important. And just to back up a little bit, something that I know everybody in this room understands, but one of the reasons it’s important to have women at the table is—when we’re talking about peace and security and negotiating an end to conflict, is that, as I said, what the data shows is that that makes a difference. That makes a difference in terms of cost. You know, one of the—one of General Mattis’—my favorite quotes from him is his saying, you know, if you don’t fund diplomacy efforts you’ve got to give me more bullets because I’m going to need them, and that’s a message that we need to continue to give to people on a regular basis. Right now, as Anne pointed out so well, what we’ve done is we have—we are in the process of dramatically plussing-up the military, and I support that effort. I think it’s important for us to do that. But at the same time, we have been undercutting our diplomatic efforts both in terms of personnel, in terms of funding. I mean, the idea that we would cut the State Department 30 percent, given what’s going on in the world right now, makes no sense at all. Now, I don’t think Congress is going to do that, just as we didn’t do it in the last fiscal year. But the idea that this is a position that the administration has taken is not acceptable and we need to continue to point that out every opportunity that we have. As we all know, you know, we can win the battle as we did in the short term in Iraq before we withdrew our troops. But unless we’ve dealt with governance issues, unless we’ve dealt with economic development in those countries, unless we’ve dealt with all of the other issues that are on the table that provide for instability, we have not solved the problem, and we’ve got to continue to make this point every time we can. BRENNAN: In the back of the room there. Q: Good morning. My name is Najiba Khalil with Voice of America, Afghan Service. SHAHEEN: Nice to see you. Q: —first of all, I would like to congratulate you with your dedication, hard work and efforts towards this great cause, and as a woman, I would like to thank you from the bottom of my heart. I appreciate that. You mentioned—we talked about Afghanistan. You mentioned, as you probably—everybody is aware that yesterday was the peace conference—peace talk with Taliban, between government of Afghanistan. Government was supposed to—gave their proposals to Taliban. I have talked to many women in Afghanistan for the past several days. Their concern is—although in the pictures on the conference you see that women are sitting there, their concern is—they are saying that this is—basically, their roles are symbolic. They don’t have actually a say—that nobody is listening to them. They actually want their—active participation, that their voices should be heard—their opinions. If you talk to the women outside the circle of Afghanistan, even inside the circle, they’re saying that they are hardly heard. And you say that women are empowered, but they are saying that their role is basically symbolic. How their concern can be addressed? And what do you have to say to them, Senator? Thank you. SHAHEEN: Well, we need to make sure that their role is not just symbolic. As we know, that’s what sometimes happens for women. We are given positions without the opportunity to make decisions, and so we need to make sure that that changes. And I think the way to do that is to continue to raise these issues, so to raise them with all of the people we have on the ground in Afghanistan, to urge that they raise it with the leadership, with President Ghani and the leadership in Afghanistan, because, as we all know, change doesn’t happen overnight. And it’s not a one time and we’re done in terms of raising a concern. It’s something that we have to keep at again and again and again. BRENNAN: On the—on Afghanistan, it’s the vice president who speaks to President Ghani perhaps most regularly. Have you talked to Vice President Pence about this? BRENNAN: OK. I just want to move around the room here on this side. Q: Thank you both so much, and congratulations, Senator Sheehan, and also congratulations, Margaret, on your new role. Q: So excited to see that. My name is Xanthe Scharff. I’m the executive director of the Fuller Project. We’re a media organization reporting on women, and thank you for raising the point about storytelling and the importance of that. We have been reporting on these issues and one of our recent reports in The New York Times talks about women in special operations in Afghanistan, which the U.S. has been supporting, and the physical dangers that they face. So I’d like to raise the question—an implementation question—about when women step forward in a political environment in a place like Afghanistan or other challenging contexts, how can—how can concerned parties help to ensure their physical security. SHAHEEN: Well, hopefully, we have—as part of our troops on the ground we are supporting those women. We have provided for funding to help engage more Afghan women in law enforcement in Afghanistan and making sure that they have the proper training and equipment that they need. I think those are the best ways that we can address it. BRENNAN: Here in the front of the room. Q: Hi. I’m Jenna Ben-Yehuda. I’m the founder of the Women’s Foreign Policy Network. Q: It’s nice to see you again, and thank you, Senator Shaheen, for your leadership on the letter. I co-authored that letter. Margaret and I had a conversation about that and there are a lot of women in this room—can I ask you to raise your hands, if you’re willing—who signed that letter and, obviously, hundreds more, who are not here. It’s discouraging to not see any response from Secretary Tillerson or Administrator Green. We’ve seen some action on the part of the secretary, as Margaret notes, but it’s been kind of halting. We’ve seen nothing from the Pentagon. What can be done? What else can we do? There’s a lot of talent in this room. Who can we call? What are the measures that those of us who care about these issues can undertake in this, obviously, very challenging environment to support your efforts and to continue to ensure that as women step up for these roles that they won’t put their own safety at risk? SHAHEEN: Well, one of the things everybody can do is contact, as I said, members of the Senate and the House and let them know that we need to provide oversight to address these concerns. You know, right now we have—first of all, we don’t have enough women in elective office. I mean, that’s—I haven’t said that but that’s the obvious, you know, because we have 50—over 50 percent of the population and we make up 20 percent of the Senate. We’re at the highest number we’ve ever been but we only have one person on the Foreign Relations Committee—one woman. Now, we have seven women on the Armed Services Committee. So in terms of what’s going on in DOD, there’s a great opportunity and women have really stepped up and worked together around sexual assault in the military with trying to spearhead changes there to make a difference. So that’s a place where there is an opportunity because we have more women and, obviously, there are a lot of men who care about these issues. You know, these are—these are bipartisan concerns that women and men care about. So we need to talk to people and let them know that this is something that we care about and we’re going to—we’re going to continue to monitor how people are responding on these issues. BRENNAN: But your answer is it has to be—it has to be kind of grassroots like that? It has to be calling your senator and your congressman? SHAHEEN: Well, I think, given where we are in terms of control of the government, yeah. I mean, unfortunately, I think we have—some of the issues that we’re talking about have not been priorities for the leadership of this government. And let’s be honest about it—they haven’t been. And so unless—if we’re going to make that change, then it’s got to come from the grassroots because it’s not going to come from the people at the top. So we’ve got to continue and, as I said, we can’t—we can’t assume that just because you call one time that that’s an end to the conversation. It’s got to be ongoing. We’ve got to keep at it. We can’t—we can’t just say, well, I did my bit—I’m done—you know, I wrote one letter and that’s all I have to do—because that’s not going to make the change that we want to make. So, you know, I believe in democracy. I think democracy works. But it only works to the extent that we’re all engaged in it and that we push to make it move in the way that we want it to. So I think that’s—in this environment that we’re in that’s the best way we’re going to see something happen. BRENNAN: I do want to follow up with you. On the law as you have it written, I guess there is a requirement for the State Department to provide a report one year in and then there’s some action that has to be, I believe, taken at the White House level. Have you heard anything from the National Security Council about how they’re going to address Women, Peace and Security? SHAHEEN: I haven’t, and I’m pleased to hear Mark talk about the work that’s going on with the National Security Council. In fairness, I have not talked to them about it so I don’t want to—as we heard from Mark, there are—there is work going on there. So I’m pleased to hear that. BRENNAN: Do you know when the State Department is going to brief you or have they briefed you? BRENNAN: You don’t even know who that would be, right? SHAHEEN: I don’t. Again, I haven’t asked for that kind of briefing. BRENNAN: OK. More questions here. Can we go to this middle table? And then we’ll go to the back of the room. Q: Yes. I’m Karen Mulhauser with United Nations Association. And I want to join Lyric in thanking you so much, Senator, for your leadership and for the—for the bipartisan Women, Peace and Security Act. It’s so important and I want to thank you also for having the act require that there be a strategy in October. I think that's very important, so that was kind of related to your last comment. And is there a role that the Congress can continue to play in helping to shape the message in that strategy? And with response to your appeal to Citizens Action, I live in the colony of Washington, D.C. and I don’t have a senator. I’ll adopt you. But I wonder if there are things that you think—that you know that we can do in D.C. until we get statehood that can have an impact on what Congress does. SHAHEEN: I support statehood so—(laughter)—I will point that out, and I appreciate your pointing out the Women, Peace and Security Act was bipartisan. I should give—acknowledge my co-sponsor on that, Shelley Capito from West Virginia, who was very helpful in moving the act. So that is important. You know, again, I think the kind of grassroots activism that we’re seeing that makes a difference—attending hearings, raising questions even if it’s not—even if you don’t have a senator—Eleanor Holmes Norton can raise these issues and she’s very effective at it. So looking at other ways in which you can raise the concerns. You know, I encourage everybody to write to the White House because we have seen this president be responsive on—when he hears from a lot of members of the public. We’re seeing that play out with guns right now. So I do think—you know, I used to say when I was working on a campaign that half of everything you do is wasted but you don’t know which half so—(laughter). So you just—you got to keep thinking about ways in which we can push on the system to make it respond, and it is a bureaucracy and it doesn’t move easily and it’s very frustrating. But if we give up, then we have no chance at influencing what happens. BRENNAN: I think I’d promised the back of the room there. Yeah. Q: Hello. I’m Naylar Arnoss (ph) with the National Defense University. Q: —for all that you do in the Senate. What I’d like to do is ask you what you hope the passage of this bill will ultimately accomplish. If you were looking out 10 years, what is it that you’d like to see that you don’t see now? What would success look like? Thank you. 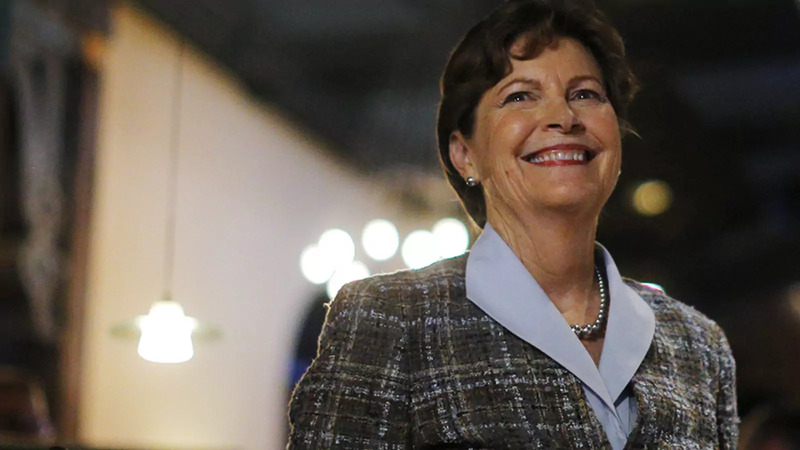 SHAHEEN: I think it would have women at the table. Whenever we’re looking at conflict areas, they would be part of those negotiations, and I think long term what that hopefully means is that there’s less conflict in the world. You know, that long term is where I hope this helps to lead us. BRENNAN: —Geneva talks to make sure that there are women from the community represented. OK.
SHAHEEN: And, you know, as we look at what’s happening in Iraq, that’s another place. As we look at Africa and some of the conflict areas in Africa and Nigeria, all to make sure that women are part of those conversations—Yemen. Q: Hi. My name is Rosa Ailabouni. I work with Navigator Management Partners. Thank you so much for being here today and for addressing this law that has been passed. My question is a little bit different. So we’re beginning to see a trend of women in the Middle East who are rising and volunteering to become a part of their respective militaries and, for example, we see the women in the Kurdish part of Syria really rising to the front lines. We see, you know, women in the Jordanian armed forces part of special operations helping other women in Afghanistan, and then this week, for example, we saw Saudi Arabia took, I guess, a stand and said that they would be willing to open up military applications to women or applications for women to join the military. And so I wanted to ask you your thoughts on how, you know, the passing of this law could help support these women as they’re trying to take that next step and become a part of their security forces and really make a difference in their countries by becoming more vocal in their militaries. Thank you. SHAHEEN: Well, I think, as you point out, having—and as I talked about earlier, we know that women, when they’re on peacekeeping forces, for example, are better in dealing with the conflict there in lots of ways and not engaging in sexual violence and helping to address those issues. And so I think the more we can encourage women to be in those roles, the better, because it puts women in a place to make decisions that are important as we look at whatever is going on in the country. I mean, it’s one of the reasons I’m a big supporter of making sure that we opened up our military here in the United States to women at all levels. So I think it’s—it will be very important. BRENNAN: We have time for one more question. Here in the back. Q: Thank you. I’m Alex Arriaga. I’m with Strategy for Humanity. And many of us here were in a meeting yesterday that was organized by the McCain Institute and Futures Without Violence. It was an extremely bipartisan meeting with people in the current administration and previous administrations and experts who are here looking at this act. Thank you so much for your leadership and for making sure that this happened in a bipartisan way. When we were looking at the issue of women, peace and security, we were looking very much at how security and peace operations need to take into account the conditions that women face in addition to their participation so that they can have meaningful participation. And as we were looking at operationalizing this and really changing conditions so that that is possible, one of the touch points was that the act has in it an opportunity to have monthly briefings and what would be really helpful perhaps is to have key contact points perhaps at the staff level in the Senate and the House where some of civil society can touch base with that staff as you have those monthly briefings with the administration. So in the lead-up to the strategy, there can be really some follow-up about what would be in there and we can all be helpful. So I wanted to pose that to you in terms of how this group can really input in that expertise. SHAHEEN: I think that’s a great idea. Really good idea. So we will try and figure out how we can implement that in a way that addresses that. Thank you. BRENNAN: I promised to get you all out of here by 9:30 and we’ve hit exactly that mark on the clock. So I wanted to thank all of our members for joining us—this was on the record—and thank Senator Shaheen for starting the day with all of us.